American Legion Post 88 Legion Riders Director Tom Skinner presents a check to Elaine Hess from the Veterans Honor Bus to D.C. Organization for the purchase of three seats for Ashland County veterans to visit the national capital. From today’s Ashland, Ohio, Times-Gazette: American Legion Post 88 Legion Riders presented a check to Elaine Hess from the Veterans Honor Bus to D.C. Organization for the purchase of three seats for Ashland County veterans to visit the national capital. The trips are organized through Southview Grace Brethren Church (Mark Abel, pastor). 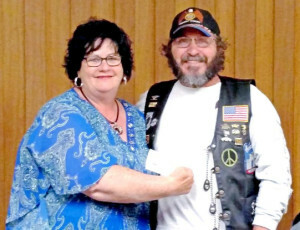 The money was raised during the Legion Rider’s Biker Ball in February.